The Patton CopperLink CL2300 series of Ethernet Extenders resemble the older Patton 2161 and Patton 2162 series of Ethernet Extenders. The new CL2300 units are backward compatible with the 216X series and introduce the Patton Trinity 3 Operating system. Furthermore, the CL2300’s offer a PoE option, SSH, Remote Management, and Stateful Firewall. These extenders are typically used to extend Ethernet to distances between 3/4 mile and 5 miles. They bond up to 4 twisted pairs to achieve the desired rate and reach. 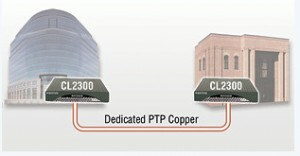 Patton’s CopperLink™ Model 2300 is a cost effective Ethernet Extender capable of achieving bandwidth rates of over 60 Mbps. The CL2300 is the ideal choice for providing internet access to bandwidth hungry small to medium size offices, wireless backhaul, Metro Ethernet, even LAN to LAN extensions. The Model CL2300 is cable of bonding from 1 to 4 pairs to increase overall bandwidth. Each pair is capable of up to 5.7 Mbps to 15.3 Mbps pending your distance requirements. The ability to configure pair bonding and various line rate modes enables service providers, integrators and businesses to choose the best available rate vs. reach combination for the application. The CL2300 supports defaults to plug-n-play mode which will allow the CopperLink Extenders to pair up automatically at the best rate achievable. Should a pair be faulty the CL2300 will automatically adjust the line rate to ensure the network connection remains stable. In addition to offering all Patton’s highly regarded CopperLink plug and play features, the managed CopperLink series adds a higher level of network control for the more demanding applications. The network management port is securely protected. Stateful Firewall inspection of traffic, accomplished through the creation of Access Control Lists (ACLs), enables the filtering of traffic based on numerous criteria including source and destination IP address, port, connection state and protocol. Logical and physical ports are selectable for bridging. Features such VLANs are configurable on a per port basis. Bridged traffic can be tagged and prioritized according to user defined parameters. The CL2300 offers easy installation. The variety of configuration options include CLI via Console (RS232), Telnet, or SSH. Also included is HTTP web based management, and SNMP. Patton’s managed CopperLink series offer the versatility and reliability demanded for the most critical network applications at an affordable price. These units are backwards compatible with the older Patton 2160 series and they can be teamed with Patton’s CL4324 DSLAM as CPE units.